Acclimation of reef corals to environmental conditions has been related to metabolic response at large geographic scales, but regional relationships have rarely been described. 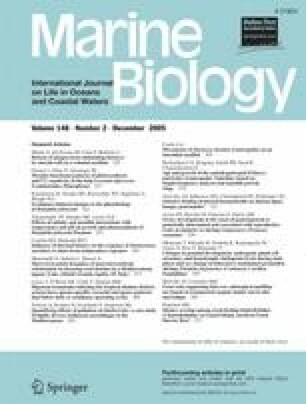 Physiological responses to temperature increases of Montastraea annularis (Ellis and Solander 1786) from an inner lagoon and an outer barrier reef in the Gulf of Honduras, southern Belize, were compared in May 2003. The hypothesis that inferred differences in thermal history would result in contrasting responses to elevated temperature was tested. Ambient seawater temperatures adjacent to corals at 4–5 m depth were measured every 15 min at inner lagoon and outer barrier reef collection sites for 1 year (June 2002–May 2003). Monthly averages and 3-day running averages (warmest period, July–October 2002) of daily maximum seawater temperatures were significantly higher (by ∼0.5°C) at inner lagoon reef compared to outer barrier reef sites. M. annularis photosynthesis (P) and respiration (R) rates were measured in respirometers at six temperatures between 29°C and 35°C approximately every hour, with repeated measurements over 3 h. P and R were significantly lower across most temperature treatments for samples collected from the inner lagoon compared to outer barrier reef. Both inner and outer reef M. annularis displayed an increase in P and R with increasing temperature between 29°C and 32°C, but above 32°C P and R sharply declined. P/R ratio versus temperature showed a significant difference between the elevations of the regression lines suggesting that M. annularis from the outer barrier reefs may have been more physiologically stressed than those from the inner lagoon reefs when exposed to acute temperature changes. These results emphasize that thermal stress must be considered within the context of acclimation temperature, and that short-term exposures may have physiologically important effects on this species. Successful completion of this work would have been impossible without support from a variety of individuals, groups, and organizations. We thank B. Kjerfve, and W.D. Heyman (Texas A & M, Texas) for their support and expertise in the Gulf of Honduras. We are grateful to W. Maheia (Executive Director, Toledo Institute for Development and Environment, TIDE) and the TIDE staff for logistical support in southern Belize, and their expertise in Port Honduras Marine Reserve. J.D. Spurrier, J.M. Grego, R. Vesselinov, and S. Gilman provided statistical advice and support, and L. Rodney offered assistance, support, and expertise in the Sapodilla Cayes Marine Reserve. D. Wethey, P. Edmunds, K. Schneider, J. Jost, S. Gilman, K. Nylund, M. Henry, D. Strickland, J. Adams, L. Szathmary, and A. Castillo improved various versions of the manuscript through helpful comments and advice. Funding for this study was provided from a variety of sources including The Nature Conservancy, the Toledo Institute for Development and Environment (TIDE), and the National Science Foundation (OCE-0323364 to BSH). This research was conducted under a research permit provided to the Toledo Institute for Development and Environment (TIDE) from the Belize Fisheries Department. All experiments in this study complied with current laws of Belize and the United States of America.